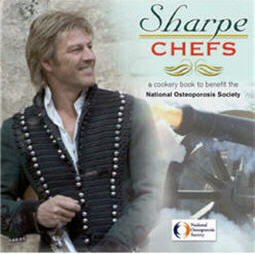 �Sharpe Chefs� is a group of women who were brought together out of their admiration for Bernard Cornwell�s character, Richard Sharpe, and the actor who portrayed him, Sean Bean. A home-grown effort by a bunch of ladies from diverse backgrounds and cultures, the first book, Sharpe Chefs, was a resounding success, beyond the imaginations of the ladies involved. The response from the cast and executives of the Sharpe series as well as the inspiring support of the author Bernard Cornwell himself, was truly amazing. The response of the public who often went to great lengths to obtain a copy was simply astonishing. Now, the Chefs are back! 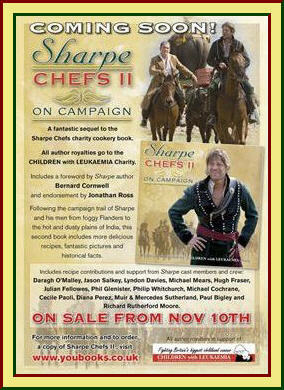 A collection of recipes themed on Richard Sharpe's wide-ranging adventures, photographed by the contributors themselves, the second in a series, 'Sharpe Chefs: On Campaign� - is now available for pre-order in anticipation of its release on November 10, 2008. This time the beneficiary will be the charity Children with Leukemia, chosen for us by Bernard Cornwell, author of the Sharpe books, who has kindly given us his support once again. Also contributing again are Daragh O�Malley (Sgt Harper), Jason Salkey (Rifleman Harris) and Lyndon Davies (Rifleman Perkins), as well as additions from other cast members and some surprises joining us for the first time. Each sale of this book will generate �2 for the charity. Following the launch, the book will also be available at Waterstones stores and other bookshops. Crafted with the same love and care, supported by even more members of the cast of Sharpe, Sharpe Chefs: On Campaign provides a fitting companion to the first volume. 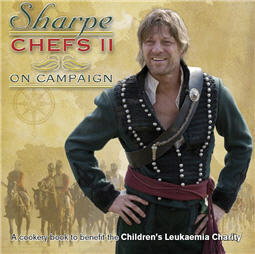 A limited number of volume 1, Sharpe Chefs, are still available through the publisher, Pickard Communications, and Waterstones. Please note that ordering through the publisher will ensure maximum benefit to the charity. This is not official and I am not Sean. If you have any questions or queries please use the CONTACT FORM. Your submissions for contact will not be posted anywhere within this site. Images, etc are copyright their respective owners. No infringement intended.